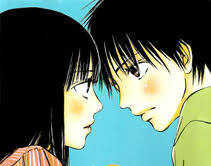 A Devil and Her Love Song | Manga Reviews ~ Ramblings of A Fob. I finally managed to read the first volume of this series. I initially read the first chapter when I was at Barnes and Noble. I found it refreshing and entertaining. Anyway the first chapter definitely hooked me, but somehow after reading the entire content it became somewhat average. It felt a bit draggish especially around Maria’s social circumstances. The series was such a nice breath of fresh air as Maria’s personality diverge from the shojo heroine stereotypes. I really like her and adore her bluntness and sassy-esque characteristics. But this series uniqueness is its downfall as well. Maria Kawai has been expelled from her previous school and gets transfers to a public school. Maria is having a problem socially as she is blunt and people thinks she’s an arrogant snob. I have had problems with the way how the characters interacts. It presents a different take on the usual “introvert girl story” instead Maria has problems making friends because of her bluntness and her peculiar way of thoughts. She has an unusual perception of things, she look at the situations with a different mindset that sometimes it just leaves me uninterested. Like when she tries to make friends, the way of how she reacts to the other girls and them to her its a tad abnormal. I don’t like how the mangaka formulates her characters way of logical thinking. I love Maria though and she makes the ridiculous situations a wee bit bearable. Really the excution of the story became less as the story went on. I wasn’t really aware of what is happening around the characters, all I know is Maria is dislike by her peers and that only the 2 guys are concerned to her and one is much more symphatetic than the other.. I like Maria enough that I am still looking forward for the second volume. I really like her and sometimes I find her occasionally funny. I’m drawn to the main heroine so I will still goin to read the story further. I like the art, there is nothing amazing about it but it just so cool. I don’t know it just have this cool effect, abit of gloomy-ness feel about it. Maybe because of the underlying “religious” theme it has..